Learning about Kindergarten by reading books are a great way to introduce the concept of school. To help promote comprehension and sequencing, you can do this simple picture activity with any book. Here is an example of this that I thought was really neat. What a great way to reinforce reading and enjoying books in a fun activity. The Book Look Out Kindergarten, Here I Come (Picture Puffins) was used for this activity but you can select any book. Cardstock or Construction Paper 9 x 12inches. Look for printables matching a book or draw your own. Some books have black line masters you can use. Check author's sites to see if they have materials for teachers that you can use. Colored Pencils or Crayons to color pictures. Laminate for long lasting results. Large ziplock to keep in. Hand draw, find free printable pages or some books will allow you to xerox pages for educational purposes but this may vary depending on the author/book. Mount on construction paper or card stock and laminate. Talk about what happened in the beginning, middle and end. For older children you can talk about what happened first, second, third, etc. Line up the pictures in the order your child thinks happened and talk about what is happening in each. Check with the book if necessary. Find a few wordless books and let children tell the story. See some of our suggestions below. 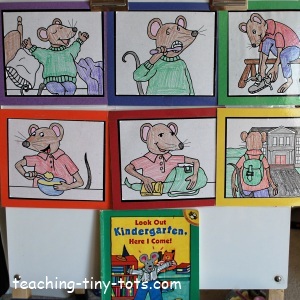 This helps them focus on using picture clues and develop creativity and language. Always check to see if there are copyright restrictions if you plan to xerox directly from the book. I do recall that if it is used only for educational purposes, some books will allow you to xerox pages.